As a professional hypnotist and dental hygienist, I am an expert at motivating people to make behavioral change, and helping medical patients master self-hypnosis at every level. There are over 12,000 peer reviewed studies showing how hypnosis can be effective at helping you feel your best. At By The Sea Hypnosis we provide and empower individuals to use the power of their mind to heal and achieve their goals by experiencing and learning success tools and recourse they have to achieve success in their life. Stephanie moved to Florida from Colorado to pursue her love of the ocean and enjoy Florida. She has been in the health care profession for over 25 years as a Dental Hygienist and now a Certified Medical Hypnotist. She is a Graduate of Hypnosis Practitioner Training Institute, or HPTI, with over 700 hours of Hypnosis training and 200 hours of supervised practice. 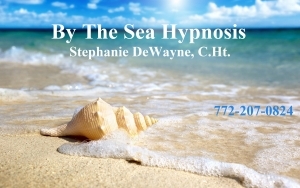 Stephanie has studied NLP, Regression, Medical and Dental Hypnosis. She is Certified in Virtual Gastric Band, Quit Program and has worked with Test Anxiety clients for Boards and other Testing, as well as many other techniques and modalities in Hypnosis. Stephanie is a member of the International Medical and Dental Hypnotherapy Association. Stephanie believes that the mind is a powerful thing and that exploring the potential of your mind to love and forgive is one of the most powerful gifts you can give yourself. Achieving your goals and enjoying life can be challenging at times. That’s when hypnosis can change your journey and overcome the challenges. By leaning powerful tools and techniques to implement at the speed of thought and make the necessary changes you want in your life.